"Dasein" is a German word from existentialist philosophy meaning, roughly, "the being" or "being there." When we created Dasein, we wanted our bags to spotlight the person behind the fashion accessory, rather than the brand itself. We believe in creating fashion that matches individual expression, rather than a means to sell expensive designer logos. Today's handbag market is dominated by a handful of outrageously expensive designer brands. We're the brand for true bag lovers who just adore a particular handbag style rather than the logo out front. We're for those of you who still love designer bags for their gorgeous, luxurious styles, but hate the designer price tag. With everything affordably priced, we make the latest handbag styles of the season accessible to every budget fashionista. So go ahead and pick up that gorgeous looking bag you've always wanted, at an unbelievably bargain price. 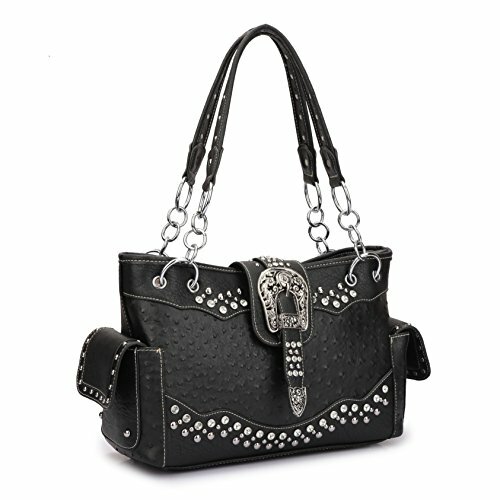 ✔Features: Made of high quality Ostrich faux leather or Floral style features with American rhinestone exotic leatherette ostrich, matching silver toned studs and zipper pulls and hardware. ✔ 100% NO RISK Money Back Guarantee;✔Ship from Los Angeles;✔FREE Standard Shipping In Contiguous United States;✔Find storefront of Fashlets, more surprises are waiting for you!